I love to spoil my sweet kitty, Scarlet. She is a 2 year old furry ball of fun. I am always buying her new types of treats to try and new toys. I love how she actually plays with the cat toys I get her, and they don’t sit and collect dust. 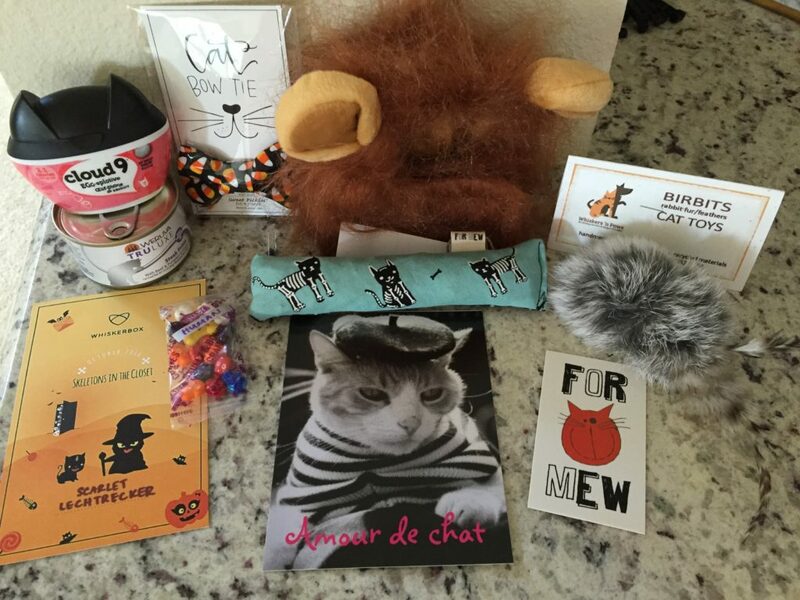 When I was asked to review a themed cat subscription box called WhiskerBox, I knew Scarlet would love it! 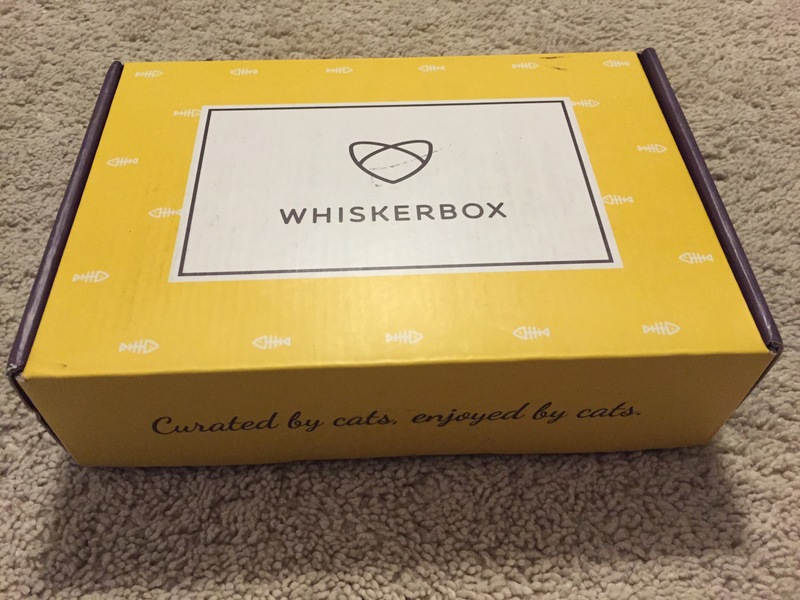 Every WhiskerBox item is pawpicked from around the world and tested by fellow felines. 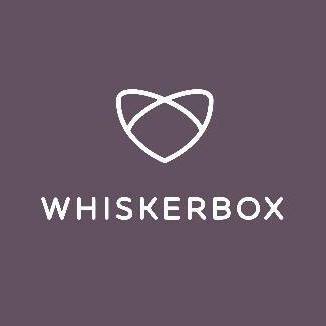 Only the best are selected into WhiskerBox each month, including stylish apparel, stimulating toys, scrumptious treats, and specialty items. The process is very simple. Go over to WhiskerBox and click “Get Started”. Once you do you will come across a page that gives you the different subscription boxes offered. Below are the two options. I was able to review the WhiskerBox Gift. My box arrived very fast, and my kitty and I were very excited to open it and see all of the goodies inside! This box was filled with the cutest cat items! It included an adorable Lion halloween costume, candy corn bowtie, 2 cat toys, cat treats, wet cat food, and even candy for us humans! Scarlet loved checking out the box! She was sniffing like crazy at all the items. 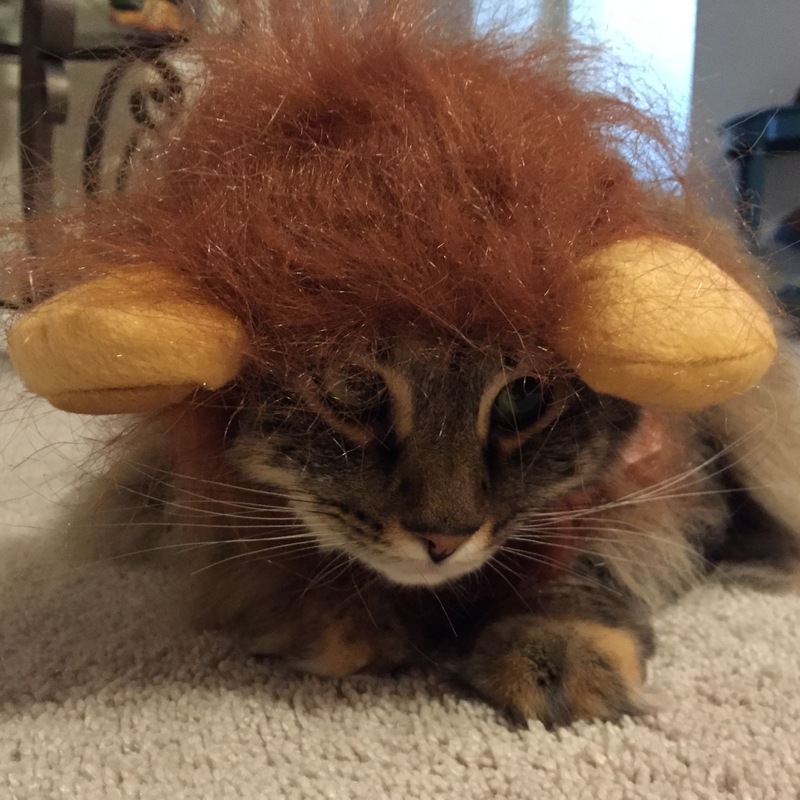 Scarlet is ready for Halloween in her lion costume!! Lots of goodies for one happy kitty!! The items that came in the box were definitely of high quality. I will be ordering a subscription since this is such a fun way to treat my fur kid each month. You can customize your box with replacing edible goodies with something non edible, and you can put in your cats weight for apparel sizing. This is such a cute idea, and I am so happy that Scarlet and I were able to review this. What a great gift this subscription box would make for the upcoming holidays! 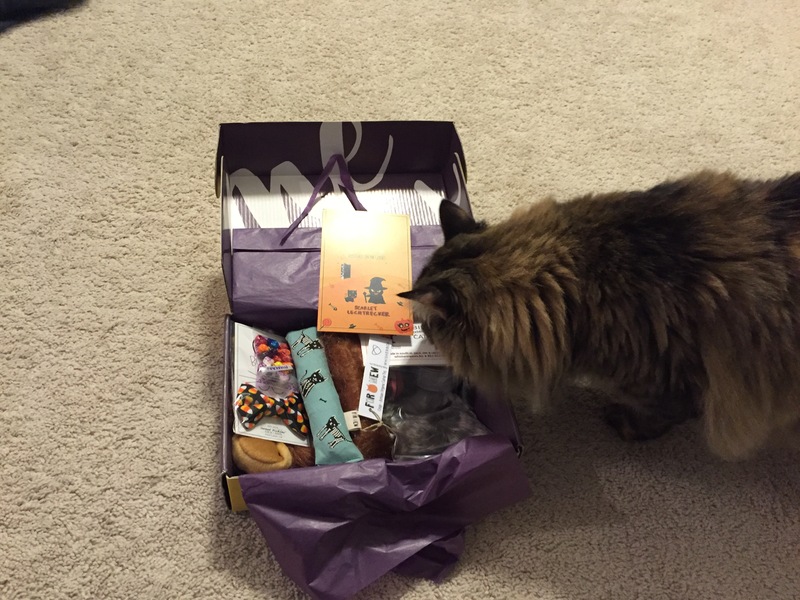 Scarlet loved everything that came in the box, especially the cat treats! She went crazy over those. I am sure your kitty will also! Order your subscription here. If you sign up at this link and use coupon code mommyhastowork at checkout, you will receive 10% off each subscription box for life!! *I received a complimentary box in exchange for my review. All opinions are my own. This review also contains an affiliate link. 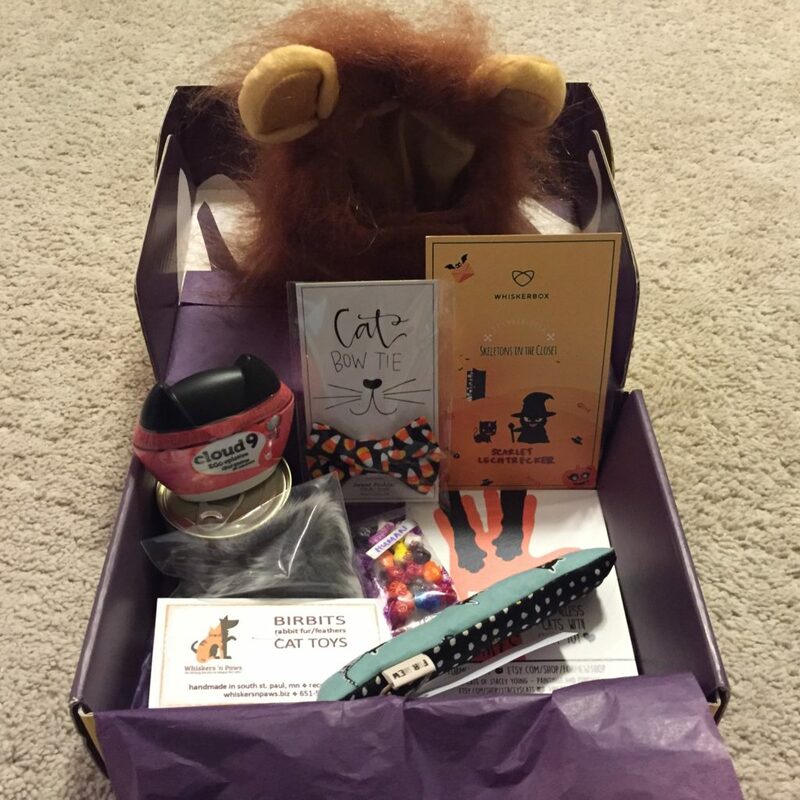 I’ve heard of pet subscription boxes for dogs but this is the first I’ve seen for cats. I like to spoil my cat and will have to check this out.